CLS uses cast-in-place concrete technology to ensure our structures are rock solid. CLS specializes in building on the edges of Western North Carolina’s extreme mountain terrain. We have expertise in sloped site preparation and earth removal, erosion control, and poured concrete structures that stand the test of time and gravity. We work with site engineers, architects, contractors, and homeowners for residential and commercial projects of any scale. As a complete site work contractor, CLS is committed to exceptional client service and quality craftsmanship. CLS has provided a strong foundation for breathtaking views in many of Western North Carolina’s premier communities including Balsam Mountain Preserve, The Ramble, Champion Hills, Wolf Laurel, High Vista, and Asheville’s Town Mountain. It all starts with dirt, where it goes from there is up to you. At CLS, quality craftsmanship is evident in each aspect of our work. We thrive in extreme site conditions where other contractors fear to tread. CLS offers complete site work and concrete services for even the toughest sites. We look forward to a good challenge. Below are a few projects that show our dedication to this philosophy. Support piers were excavated to a depth of 10 feet to get to structurally stable soil below. This was much cheaper than excavating soil and replacing with suitable material. Steel reinforcement was used on support piers, and throughout the slab itself. In addition, a drainage system was installed behind the pavilion to catch and divert subsurface drain water that had historically been a problem in this location. 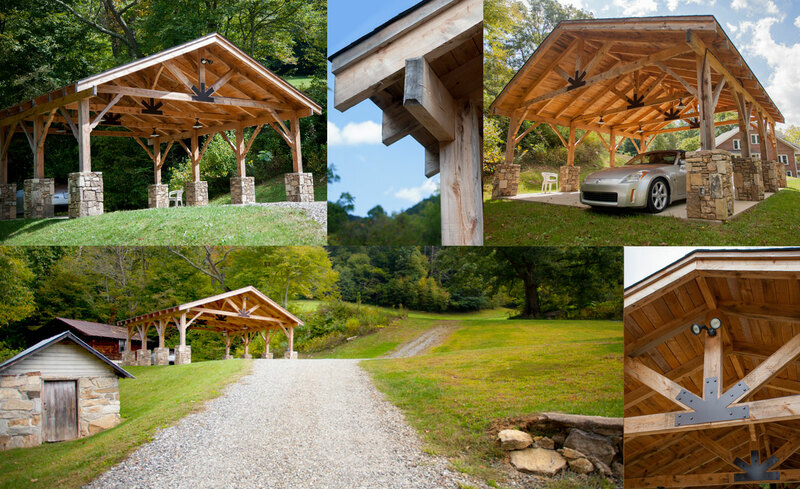 Structure was constructed totally from scratch, using rough sawn hemlock timbers. All electrical wiring, conduit, and boxes were hidden from view, as were all of the fasteners for the structure itself. Columns were laid using Tennessee Fieldstone in a dry stack look. If you are considering building on the edge, or anywhere in between, CLS can help ensure your next project is built on a solid foundation. We can also help you determine where to build and show you how to maximize site opportunities and address any potential challenges. Contact us today to learn more about our site preparation and custom concrete services and capabilities.